The Skyliners pre-Juvenile team poses after its performance at the 2017 Eastern Synchronized Sectional Championships in Hershey, Penn. The Skyliners took home the Gold in every division they entered. The Skyliners synchronized skating team traveled to the 2017 Eastern Synchronized Sectional Championships on a mission—to perform its best and earn the coveted spots to the National Championships. Instead, their results were historic. 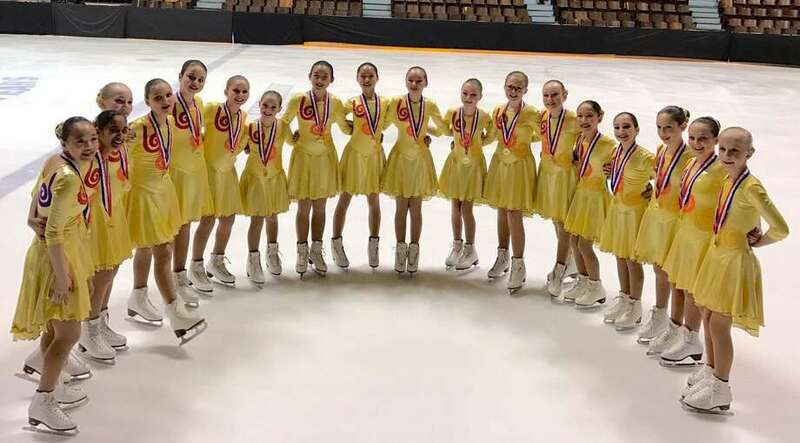 Skyliners became the gold-medal champions in every division they entered; Preliminary, Pre-Juvenile, Juvenile, Intermediate and Novice. More than 2,000 synchronized skaters gathered in Hershey to compete at the Eastern Sectional Championships. Of those, Skyliners sent 123 skaters, ranging in age from 7-18. Representatives from New Canaan include Lucy Potter of the Novice line; Nikka Staron of the Intermediate line, Taylor DelCarmine, Priscilla Liao and Kat Root of the Juvenile line; Emmy Eason, Marissa DelCarmine and Charlotte Flanagan of the pre-Juvenile line; Cora Linn Burke and Fifi Staron of the Preliminary line. Among the nationally-qualifying lines, Skyliners earned a season high score of 76.90 in the Novice division for their dramatic “Camelot” themed program. It is the first time in Skyliners history that the Novice line became Eastern champions. In the Intermediate division, Skyliners earned a season high score of 66.62 for their riveting “Wizards” program and for the first time in five years, became Eastern champions. In the Juvenile division, Skyliners earned their seventh straight Eastern championship title with their inspiring “Angels” program, which earned a 48.21. All three of those qualifying lines move on to Nationals as well as Skyliners Junior and Senior, both of which earned byes to Nationals due to their international competition schedules representing Team USA. In the Preliminary division, where 20 teams competed, Skyliners had two lines in the field: Skyliners Preliminary captured Gold in the final round with their sassy “Wedding” themed program and Pre-Preliminary took ninth place with their rousing clean skate to their “Spanish Dance” program. Skyliners will now devote the early part of February to preparing for the 2017 U.S. Synchronized Skating Championships, which will take place in Rockford, Illinois February 23-25. Tryouts and clinics for Skyliners 2017-18 season will be announced soon. Check the website at www.skylinerssynchro.com for the latest information.